The Crick’s new building in Kings Cross is set to be a world-leading biomedical research centre. The Science Council team toured the building to find out what it takes to build a research centre of this scale and find out more about the Crick’s work. 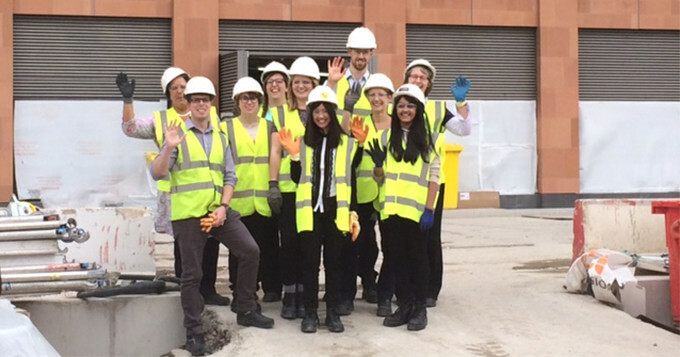 I am not sure I ever expected to see all the Science Council staff dress in hard hats, high vis vests and safety boots but that’s what happened (see photo) when we visited the nearly completed Francis Crick Institute last week. We’d all read about how ‘The Crick’ would be a new approach to research, bringing teams together from across the sciences, different institutions and the world once it is fully operational in 2016. This was our opportunity to get a sneak peek of it by taking a tour of the building in its final stages of construction. My first impression was of the sheer size of the place – eight stories above ground and four stories below with a gross internal floor area of 84,000 m2. Sitting in a porta-cabin meeting room surrounded by some of the most complicated (and neat) planning charts and commissioning timelines I have ever seen, Laing O’Rourke Project Director, Neil Smith, gave us an introductory talk full of inspiring detail about the building and its construction. We learned how much had been manufactured off site (reducing costs and carbon footprint as well as ensuring consistent quality); the planning and logistics of getting everything to the site in the right order and at the right time; and that some of the structure was so large it could only be delivered through London during the early hours of a Sunday morning. The off site manufacturing represents 40% of the overall building construction including the precast concrete frame components, architectural feature panels, external facade glazing, major plant building services (MEP) plant and over 4,000 multiservice MEP services modules including some that weigh over 12 tonnes. Neil’s constant references to the Crick vision showed how important it had been for the design team to understand how science will be done at the Crick and he emphasised the commitment both the construction company and the Crick partners made to work with and engage the local community on the project. But inside the building there certainly is a WOW factor everywhere. It’s all been so carefully thought through and planned. Design for labs and shared spaces is all about bringing teams together, breaking subject boundaries. We often talk about science existing in silos but here we have labs without walls. Gleaming bright white – I could just about imagine it full of young and enthusiastic scientists! I was less convinced about how people used to their own small lab or office will adapt to this huge openness or the shared relaxing areas, water coolers and coffee/tea points as well as administrative support stations all designed to get them up and about and foster cross-team communication. It looks and feels egalitarian – there was not a feeling of the ‘executive top floor’. Below ground is a high tech world of expensive kit and cutting edge basic science where every security and safety consideration has been worked through carefully. We were impressed to see high tech security systems, sophisticated sterilisation techniques, state of the future air quality filtering and elastomeric stretchy paint that won’t crack and much more. Another WOW feature is the 450 seater auditorium with the folding dividing partition wall that creates two 225 seater lecture theatres in addition there are also community-facing spaces including an exhibition area, discovery teaching laboratory for school visits as well as a two storey community centre to be run and operated by the local residents. The design incorporates the Crick commitment to break down barriers between the public and science, creating transparent external walls and shared spaces, including a large piazza to the main entrance opposite St Pancras train station. The institute is ideally located opposite St Pancras and a short walk from Euston station, which is one of the attractions to working here. It’s important that such an iconic science research facility doesn’t create barriers between science and the public because we want local students to aspire to be part of this project’s future – my hope is that we will see pupils from neighbouring boroughs see and feel what’s happening at the Crick and be keen to be part of its future science. The Crick shares similar values as the Science Council through its commitment to the highest quality science, its multidisciplinary approach, ambition to create future science leaders and its eagerness to engage and inspire the public. To find out more about The Crick and the amazing research that they do, visit www.crick.ac.uk.